Your Texas Estate Plan: Debt ceilings, and taxes. Where will the money come from? 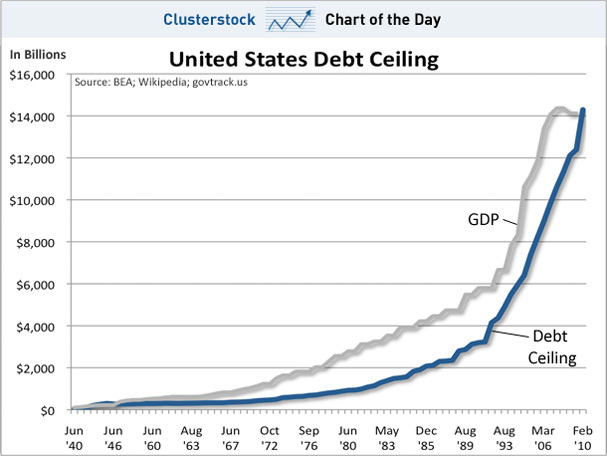 Debt ceilings, and taxes. Where will the money come from? How bad does that chart look? And that is pre-deal. The government borrows money to pay for things. It has over-extended itself. It needs to borrow more just so it can pay for what it has already committed to, as it is not taking in as much tax revenue as it has committed to pay out. However, to borrow more it needs permission. A partisan (and tea party factioned) Capitol Hill saw this looming crisis as a chance to lobby and push for reforms, budget balances, and tax or no tax agendas. We have until tomorrow to fix it, else the government won't/can't pay its bills, the markets will likely keep crashing down, our credit rating goes worse, the dollar is further devalued, interest rates spike, social security checks could not come...all bad things and more. But it was avoidable, and this is why you, the conscientious planner should call and or write your Congressman either way this thing turns out. Whenever a silly thing like this happens, your retirement gets hit. You could've lost 10% last week, maybe more. What would that have paid for? 2 years of retirement? The boat or RV you have always wanted? Maybe. Or maybe you hedged and bought gold and silver! What great foresight. But for lots of folks, your golden years took a hit this week, after taking a big hit a couple years ago. Not to mention the jargon filled "QE1, QE2, and their youngest sibling, QE3" that we have had the pleasure of experiencing, which the government thought that by calling printing more money and further devaluing the dollar "quantitative easing," no one would notice. Even if the Republicans are successful in a "no tax raises" compromise, the revenue has to come from somewhere. Congress is too scared to raise taxes, because they want to stay in office. Way too expensive to not get re-elected. Take a step down, to the states: State reps and senators won't raise taxes, because its way too expensive to not get re-elected. What's left? Cities and municipalities. How do they raise money? Property taxes. Who sets these? Appraisal districts, who are not elected. No accountability, and very little recourse. Have you tried to protest your property taxes/valuation recently? Good luck. Having a bad day, and want to see people more angry than you are? Walk into a county appraiser's office. Its awful. So, that house you have finally paid off, that second home, and that little investment real estate you and a partner bought in the 80's just became a little more expensive to own, out of thin air, even in a depressed real estate market. Make sense? It shouldn't, but tax revenues are going to have to come from somewhere, and they will come from the bottom if Congress doesn't force them at the top. There is no such thing as not raising taxes in a time when revenue is needed as badly as it is now. Texas declares the "Pole" tax constitutional.